Tina Turner, the late Leonard Cohen, TV presenter and comedian Bill Maher, the bands Madness and Led Zeppelin, actor Richard Gere and others have recently been added to the list of celebrities like actors Tom Selleck and Ben Stiller, musician Mick Jagger and former president Barack Obama who, perhaps unknown to them, have helped learners of Hebrew around the world acquire new vocabulary. 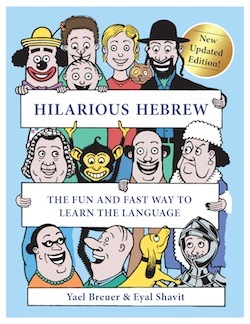 Two years after the publication of the book Hilarious Hebrew: The Fun and Fast Way to Learn the Language, a fifth print run – which is also an extended edition – has recently been published. Co-creator and Hebrew teacher Yael Breuer is convinced that, once readers find out that singer “Tina Turner does not hold a grudge,” for example, they are not likely to forget that the Hebrew word for grudge is tina. “The method is a great way to memorize Hebrew vocabulary but, in fact, could be adapted as a teaching aid for any vocabulary in any language, and we have been asked about producing versions of the book for French, German and even Chinese speakers,” said Yael Breuer. The book has been popular with Jews and Christians, tourists and students, and is sold in shops, Jewish museums and online. “The book was placed on the recommended book list by famous London-based Foyles bookstore and someone recently told me, half-jokingly, that our method could help lift the biblical curse of the Tower of Babel, which caused communication problems by separating people into speaking different languages,” she added. Hilarious Hebrew is divided into sections, which helps users identify words according to their need or interest, including vocabulary for vacationers, shoppers and restaurant-goers. It has been used as an aliyah gift to new immigrants to Israel by the Jewish Agency and has also been adopted as a language teaching tool by Edinburgh Hebrew congregation, who have started converting some of the book’s illustrations into animations. Hebrew tutorials, based on the method, are now available on the internet and co-writer Eyal Shavit, who is a musician, is in the process of composing a song using the Hilarious Hebrew method. “Just like the book, the song will teach Hebrew words in an entertaining way that will stick in the listeners’ minds,” he said. For more information, see jewishindependent.ca/from-nonsense-knowledge. 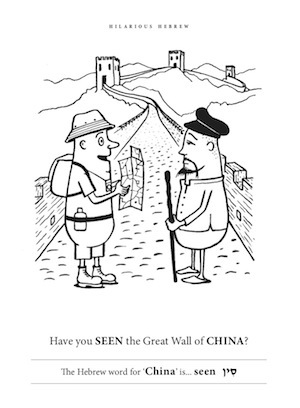 And event information about the book is available on hilarioushebrew.com; it is sold by Amazon.